I really like user reviews. You get a longer-term view on the device and the owner has enough time to find those smaller issues that can sometimes grow into annoying ones. There’s one such issue here in the Lenovo U300s review below that Daniel Rourke [Twitter] sent in but in general he’s a very happy U300s customer. If you’d also like to contribute to Ultrabooknews, drop me a line via our contact page. If you’re in the industry, an expert analyst, an owner/user or just have something serious to put forward, I’ll consider it for publication. I spend a lot of time at my computer. Browsing the net, writing my PhD, sorting through my music collection and watching TV downloads via HDMI. In the past I’ve split these tasks between two main machines, a hefty 17” Toshiba Satellite p100-347and a miniscule Asus eeePC – the 8.9” 901. With this in mind I come at the review of the Lenovo U300s with a kind of schizophrenic drive: to unite both sides of my laptop personality into one, all-round superior machine. This desire disguises a whole series of ergonomic and usability preferences that have been with me throughout a lifetime of PC use. The U300s (Intel Core i5 128GB model) is a beautiful machine. After over a month in its presence I can safely say that it has altered not just how I use, but actually what I now expect from a laptop. The most successful pieces of technology are usually those that slide into the background; that fade into the routines and activities that drive their use. The U300s is one such piece of tech, perhaps the best user experience I have had besides the iPhone. I hardly notice it’s there and that is exactly the way it should be. But is it my perfect machine? Typing is a breeze: hit a key and it responds by flashing the letter you wanted on your screen. This is what all keyboards are supposed to do. But do they? Usually not. On my behemoth Toshiba for instance, key presses had to be mediated by vertical finger pushes that always in the back of your mind you knew might fail. 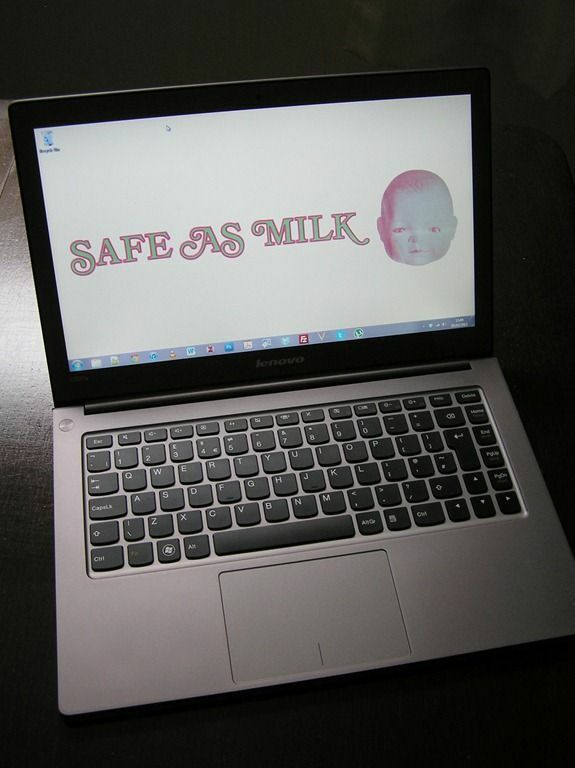 On the Asus 901, a cramped and flimsy keyboard meant it was little use for typing long essays. Slung into the depths of my bag I often took it with me to the library to take notes and look up citations. If I wanted to write properly, with either machine, I needed an external keyboard. The U300s just works. It’s that simple. For the first time ever I would prefer to type on my laptop than on a desktop keyboard. 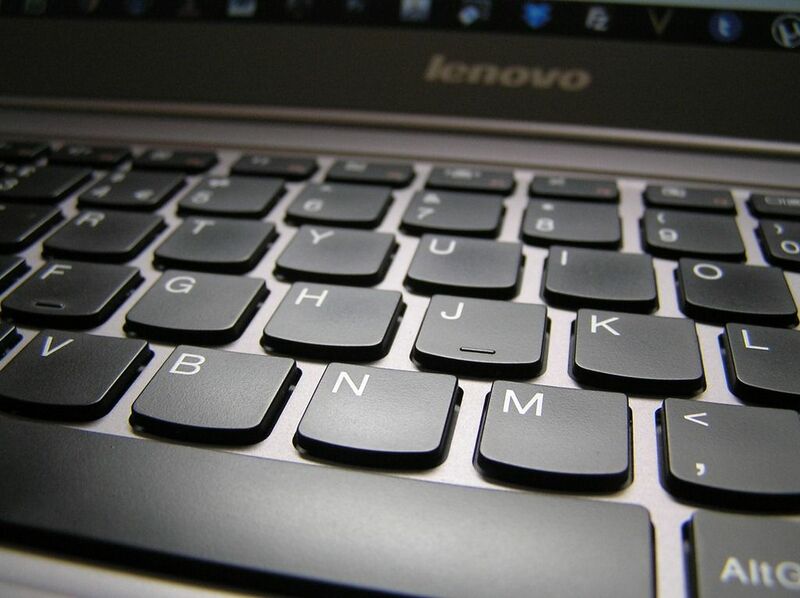 Whether it’s nestled on my knee, or sat firmly on a desk, the Lenovo keyboard never misses a tap. 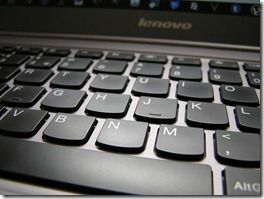 I had read about Lenovo’s devotion to quality keyboards, but I honestly never thought they’d make THIS much difference. There is not much more I can say. The U300s has a diminutive frame, hardly thicker than an iPhone 4, meaning that it slots into my bag just as easily as my old, tiny 901. Between flipping it open and opening the first program on my desktop, I have never had to wait more than 20 seconds, in fact it’s usually more like 12 or 15. The function keys work as soon as the desktop image springs into view, meaning I can turn the laptop onto silent mode even before the Windows 7 startup sound has rung: a bonus if you work a lot in quiet libraries. Similarly, WiFi and brightness buttons receive instant response, a feature I’ve never seen fully realised on past machines I’ve used. These features are the result of strong relationship between the Lenovo hardware and Lenovo bundled software, a quality I have only previously seen realised this well on an Apple machine. As a long-time Windows user and obsessive fiddler, I usually dig around in msconfig to minimise the number of programs running when my computer starts. Although Lenovo do bundle a few chunks of software that sit in your machine memory, there is only one piece of offensive crapware: a multitasking augmentation that hijacks some of your function keys and three and four fingered keypad movements. Why Lenovo would choose to stop me from pressing Alt+F2 to reopen a previously closed browser window is beyond me. Let’s just say that msconfig is my friend. 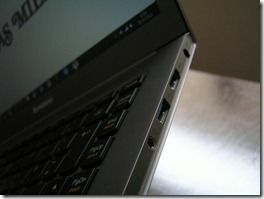 The firm metal exterior of the U300s brings several benefits to the machine, including a rigidity I had not expected to see in the Ultrabook range. Wobbling the screens of Acer, Asus and Toshiba machines in a local retailer, I felt the U300s was the strongest of the four, with Asus coming a very very close second in terms of screen flex. The metal case also gives the machine an almost awesome coldness after it has been stowed for a while. Spreading a wandering hand into the depths of my bag sends cold shivers up my arm. These little touches make the U300s feel like it means business. Never again will I put up with floppy screen hinges, or unsightly screws and joins on a laptop. In this sense, once again, the Lenovo U300s feels like the laptop equivalent of an iPhone, more so even than the more flimsy Macbook Air. During the writing of this review I can expect to push very few of the limits of the U300s. In fact, this review won’t delve into “the importance of SSD write speeds” or meditate on “the exact numbers of seconds I can squeeze from the battery” tests. But what the U300s does do, it does effortlessly, without a song and dance. The WiFi and Bluetooth are very quick and responsive, and even with both of them running and regular trips between my browser and word processor, I usually manage over 6 hours of use on a single battery charge. The screen is crisp and easy to read at multiple brightness levels. The 1366×768 resolution gives me well enough screen space to open multiple windows at once, or watch a windowed video and type at the same time. 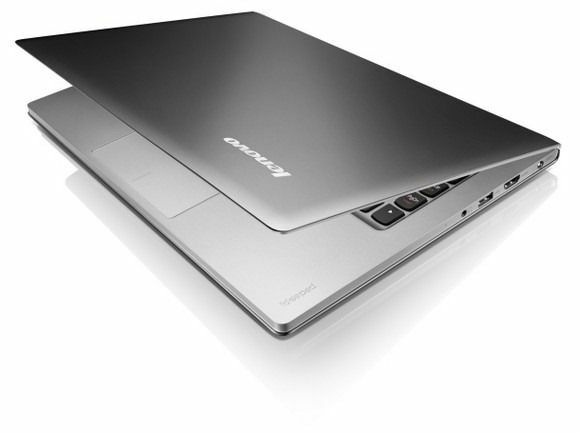 The single piece bottom, and side-on cooling ducts emit the quietest of hums, whilst keeping the laptop cool. The only time I ever had to worry about heat output was during a long game of Civilization V. The game ran well, even without a dedicated graphics card, but the experience is worth mentioning if only to remind readers that the U300s, and its other Ultrabook cousins, are not gaming machines. Shutting the machine down is as quick and painless as booting it up. The machine comes pre-partitioned, with the 128gb SSD drives split into four, ever decreasing, sections. This allows one to host the majority of the software you’ll need, with a second for drivers and original applications to live on, should you wish to return the machine to its factory settings. This means that – split between the final two, hidden and inaccessible partitions – around 20gb of space are taken up to store the OEM and factory software state. A lot of space, if you only have 128gb to play with in the first place. Delete these partitions and you void your Lenovo year-long warranty. A shame if you want to push your machine to its full potential. The backup software bundled with the machine allows you to take an external backup of this factory state, but requires a series of DVDs for the privilege. A strange decision in a machine with no disk drive, but one that can be gotten around with Virtual Drive software and some clever thinking. For me, this kind of split-thinking when it comes to drive space (“it’s your machine” vs “we’ll decide how to use this machine best thanks very much”) derives from the Apple model of usability. A model grounded by the idea that users would rather not know they had a choice in the first place, and one I personally disagree with. For a power user gripes like this are easily navigated, and for everyone else, well, let’s just say they will never need to know. The touchpad has taken some getting used to, mainly because I have never had such a sensitive, large pad on a laptop before. As an iPhone user and occasional Macbook fiddler, I have come to expect high degrees of freedom and response from touchpads, something that my previous machines have never come close to delivering. The first model of U300s I got my hands on had a Cypress touchpad and, I’m sorry to say, it was a horrible experience. 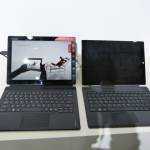 At times jumpy, at other unresponsive, with an extremely poor range of user settings. Scrolling down a long browser window with two fingers was a game of chance, mediated by screams of pain from yours truly. Augmenting the experience with extra pieces of software (TwoFingeredScroll) and hidden browser settings (enabling SmoothScroll in Google Chrome) certainly seemed to remedy some of the problems, whilst causing others to flare up at random. After some research, I took my machine back to the store and bared my geek soul to the assistants. In the end, after much wrangling on my part, the machine was swapped for a seemingly identical twin. A good twin to match the evil of its brother. A twin loaded with a Synaptics trackpad. And lo! It was good, better than good, it was perfect, it was a revelation! The trackpad worked, the software was overloaded with options, within minutes I had figured out entirely new ways to navigate my computer, the most revolutionary being a reversed two-fingered scroll option that allowed me to soar through browser windows like an iPhone addict unleashed. Once again the U300s was setting new standards in what I expect from a laptop. I can only urge those of you driven to buy this machine to demand a Synaptics model from your retailer. Cypress users, please let us know if recent software updates have remedied any of the woes I speak of above. And Lenovo – shame on you for issuing two different hardware versions of the same machine with such vastly different user experiences! But what about the negatives? What would I change? So far these changes fall into two categories: firstly: changes I would implement based on machines I have used in the past, and secondly: changes I would implement in a perfect world where U300s laptops sprouted from the ground like cabbages. The first camp of changes is not as obvious as it first appears. 10 years ago, any machine without a DVD drive was a ridiculous notion, but I would not desire anything like this in the U300s now. Similarly, I am not sure how much I will miss an SD card reader or a VGA out port in the years to come. Are they not dying additions to a machine that marches into the future? Perhaps, perhaps not. An Ethernet port IS something I will miss, and something I’m not 100% content to supplement with USB dongles. 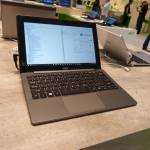 The second camp of changes I’d make to the U300s are forward looking, and probably just around the corner on many of the Ultrabooks we’ll see in 2012. Firstly, a matte screen. This ‘problem’ was remedied pretty soon after I bought the machine. Trawling eBay I found an antiglare screen protector and having now applied it, have rarely been reminded that the screen was glossy in the first place. Should laptops come with matte screens as standard? Maybe. But is a £10 screen protector much to ask? Considering the screen protector also stops my machine from receiving scratches, finger marks that are impossible to wipe off etc. whilst also helping my machine retain its “re-saleability” value. I’m happy to augment the U300s myself. Dedicated graphics is something I’d love to see in future U300s iterations, as well as user-upgradeable RAM and SSD options. Here’s to 2012! Overall The U300s is a solid machine that gives the general user one of the best user experiences out there. If you’ve ever wondered whether the PC could come back from the onslaught of Apple, this might very well be the machine to lead the charge. It’s not perfect, misses a few ports and holds its users hand a little too tightly sometimes, but the Lenovo U300s does everything the Ultrabook is capable of at the moment with panache and a whole heap of style and grace. If you want brute power, every port under the sun and masses of hard-drive space, then you’re probably not on the market for an Ultrabook in the first place. For users who desire flexibility, portability and want to revel in the shear joy of using a machine that does exactly what it’s supposed to (sadly, a rare thing in the PC market) then look no further that the U300s. The price IS higher than other Ultrabooks, but then, what do you expect from a machine that avoids cutting corners? 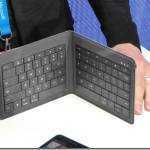 Microsoft flappy-keyboard looks like a wallet. I love it! Thanks for this detailed review! Now it comes to a decision point between this fellow and the upcoming dell xps 13. Hey Daniel, great review and very well written. Thank you for taking the time to write it up and share your detailed thoughts! And Thank you Chippy for sharing it for us! I have the orange Core i7 model with the more spacious 256gb drive (for about two months) and I absolutely love it! (No doubt, those that have seen my posts already know that). I really have nothing to add, Daniel covered it all very well, except that my machine does have the Cypress touchpad. It was definitely enough to warrant a return, terrible as Daniel mentioned. But Lenovo released an updated driver; with that and some tweaks in the settings, I am WAY happier and more satisfied with the responsiveness and two finger scrolling (even without the Chrome plugin…) My gut tells me the Synaptics is still much better, but I am very happy with mine. I just heard from notebookreview.com that Lenovo US has just added the Orange i7 to their lineup… for those interested. I have had the i5 model with 128gb ssd for about 1months now. I am also very happy (of course, after I applied the Cypress touchpad upgrade). WRT ssd, I just reformatted to one 128GB, reinstall W7, install all SW I need plus one-key recovery sw, and then created the back-up of the whole system on external HDD. With USB 3.0, it is a breeze to upload if the machine crashes and it has not only w7 but all other sw and personal tweaks in. Dan – one question to you. It happened to me about 4 times in one month that my touchpad completely frozen when I upon the computer from sleep. (The same happened to a friend of mine, who has got exactly the same machine, … and actually did not reinstall everything like me). Any experience with this? If yes, any tricks to get rid of it? Thnx. I’ve never had the touchpad locking up after wake from sleep issue that you mentioned. Strange that you and your friend both had this happen, and we all three have Cypress. Does the touchpad on/off toggle re-activate it? This may be worth seeing if you can return it for a Synaptics touchpad like Daniel did in the review. Keep us posted. Oh, and awesome work with the partitioning! Bummer, I’m sorry to hear it. So, when it happens and the touchpad is dead… a reboot is the only solution? Which power profile are you using? Maybe a wake from hibernation problem with the touchpad drivers? I use High performance. Is there a way I can ensure what touchpad I get when I buy this machine? As far as we can tell, there’s no way to tell before hand… all models, colors, from misc. re-sellers have come with both; it’s a crap-shoot. The Cypress isn’t all that bad with the latest update though. You could always return it and complain for one with Synaptcis like Daniel did! This manufacturer decision is weired. Why would they work with two touchpad suppliers? It remind me all the problems I have read about the ux31 touchpad. My tip on trackpads: ask to test out the machine in the store. Check the control panel, or the notifications section on the bottom right of the start bar. Figure out whether it’s Synaptics. If it is, say you’ll take it. THAT model you are playing with. They will be happy to sell you the model on the display floor. If it is a Cypress trackpad, go to another store. Repeat until you find one. Hi all. 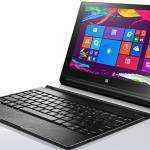 ihave just watched some videos on the web that youa re comparing other ultrabooks with asus zenbook. there is also game performances. but there is not any more reviews about lenovo. i would like to see the performance results in a video like game performance and is it compatitive with zenbook? i heard some rumors or the facts that asus is have trouble of bios and some blue screen errors occur. so i cant decide on zenbook. i need to see lenovo reviews more. there is not enough record of u300s. 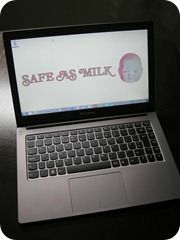 is it bacause it is not good like acer models? Buying an ultrabook to play games on is kind of nuts. For half the price you could buy a more solid gaming machine. I have to side with Nohackmove here. It really depends on requirements. I agree, it’s definitely nice to be able to game here and there on our Ultrabooks, but we all know we only have discrete graphics, ulv processors and only 4gb of ram, so while on the side gaming may be fine, Ultrabooks weren’t intended for full fledged gaming laptops. So “Dan” may i ask you and the others to try any kind of games? it would be a realy good chance to let us know. by the way today i go to a store in my town and checked the trackpad and it was Cypress. employee of that store also told me that it is new series and they are unpacking new. so i will try another store with better price cut. because there is too much tariffs and taxes in my country. As I said in the review, Civilization V ran pretty well, but made the computer quite hot. If you went a generation back (Civ IV) you’d have a dreamy gaming experience. I didn’t mean to offend by the way. it is ok. finaly i found more documents. watched reviews in my language and notice that all intel gma hd 3000 GPU works fine with medium or low graphic options in games. i realised it will also be fine for the games i am looking for. Ultrabooks are very good enough for my needs and game performance is can be called a “Drop in The Bucket”. « Asus Working on New TF300T Tablet?